After falling in love with Scream Queens, I obviously could not resist a discussion on how to be Chanel Oberlin. Portrayed by Emma Roberts, Chanel is Ryan Murphy’s fashionable “it” girl with questionable morals. After all, I do love studying a Queen Bee. And, apparently I’m not alone – both my how to be Gossip Girl‘s Blair Waldorf (here) and Pretty Little Liars’ Alison DiLaurentis (here) posts garner lots of traffic, many months after the fact. I guess we’re all a little bit fascinated by an impeccably chic girl, whose wit and bitchiness inspire a legion of minions. 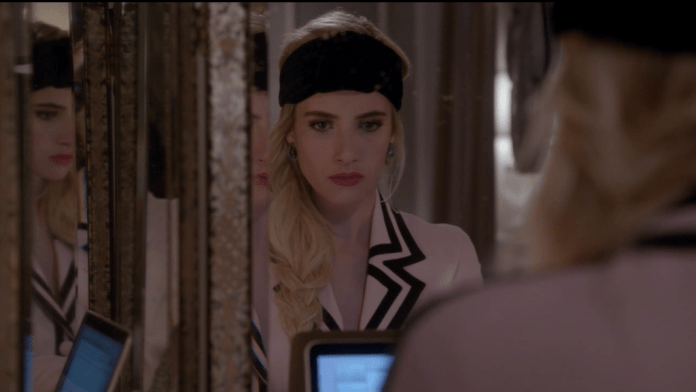 Clearly, mastermind Ryan Murphy took note of Emma Roberts’ talent of evolving into that role as Madison Montgomery in American Horror Story‘s ‘Coven’ season. In Scream Queens, he took her talent as a quick tongued ‘it’ girl and ran with it, creating Chanel Oberlin – president of a wealthy sorority girl squad at Kappa Kappa Tau. The show is clearly poking fun at Kappa Kappa Gamma, exacerbating their shallow and materialistic reputation for entertainment value – with a mass murderer on the loose. While Blair Waldorf did have a heart of gold beneath her shiny armor and ribbon headbands – Chanel Oberlin? She’s decidedly more malicious. I mean, she did accidentally murder her the KKT housemaid in a batch of frying oil and attempted to kill her sorority sister Chanel #6 (Lea Michele), thrusting her down a flight of stairs. Oh, and we can’t forget that little attempt to murder her college dean, Jamie Lee Curtis, with a healthy glass of poisoned apple cider. Yes, our girl Chanel has her vindictive ways. But, she also has a strong sense of leadership, a dream closet and a knack for rallying her followers to a cause – be it murder or a love of Halloween. When you need to take control, nothing lays the law like a well-executed email. Be it rallying your student body to support your annual ‘Chanal-o-Ween’ party, despite the mean college dean’s insistence that it’s canceled. Or, your sorority sisters aren’t backing you up? Perched behind a laptop with a plate of macaroons and a glass of rose, work your magic girl! 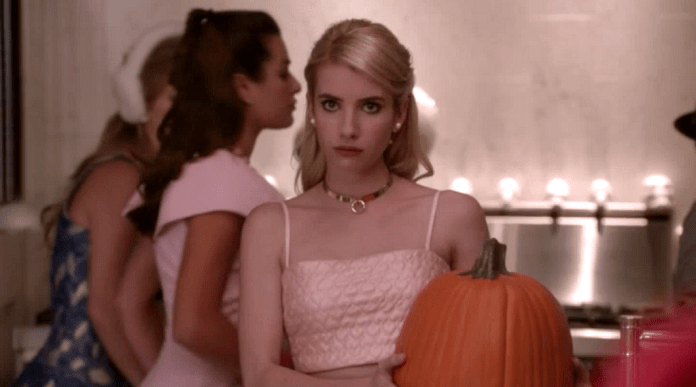 Make like Chanel Oberlin herself and go all out for Halloween. Whether you’re dressing up like Jackie O, shipping gory and bloody presents off to your Instagram followers, or building a real-life replica of The Shining‘s snow maze — Chanel-o-Ween is a cause for celebration. Go big, or don’t go at all! To Chanel Oberlin, sunglasses are more than a fashionable accessory that keep the sun out of her eyes – they’re also a weapon of power. When gearing up to firmly stand her ground, Chanel’s latest Prada sunnies are an assertion of power and that give a true don’t F with me attitude. No one knows better than Chanel Oberlin that everyone loves presents and being “stupid rich” affords you the opportunity to award your minions at will. Whether it’s to buy back their support or just because you want to look extra chic in ‘sleuthing’ hats while identifying the mass murderer on campus, a present beautifully packaged in coordination with your outfit is always a good idea. Chanel Oberlin was a walking, talking encyclopedia on Kappa Kappa Tau’s heritage. To be a great leader and build your own legacy, you have to recognize and respect the leaders that came before you. Of course, all queen bees love their shopping – and there’s no day celebrating retail therapy quite like Black Friday. Whether taunting the general public as they run wild for doorbuster deals, or scouring the Black Friday sales for cheap gifts for her friends – Chanel’s guaranteed to be at the mall when it opens. After all, nothing’s more American than going mad for things you don’t need on Black Friday! Living on a strict regimen of cotton balls and barbecue sauce isn’t enough to get a girl through REALLY tough times. The answer? A box of chocolate morsels to power your way through. Hey, we all have our weak moments. Chanel Oberlin knows the power of a great entrance. Whether boldly emerging from her closet, or upon release from jail – Chanel nails it every time. Sometimes, all a girl can do is keep her head held high and work those hips. Upon her embarrassing arrest for a silly murder (that she did commit), our girl Chanel spent no time crying alone in her orange jumpsuit. 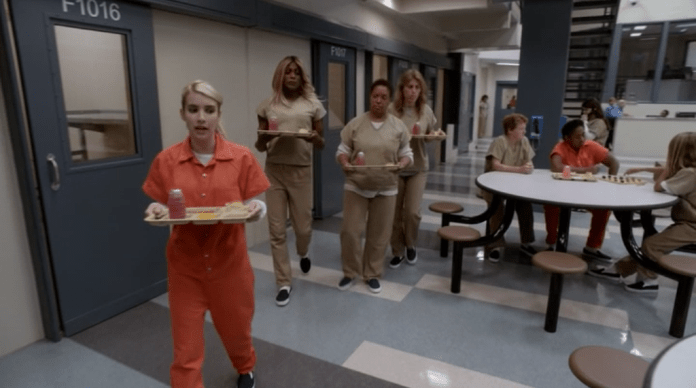 Instead, Chanel immediately got to work building her prison girl squad. Because, every great leader knows you can’t have power without followers. 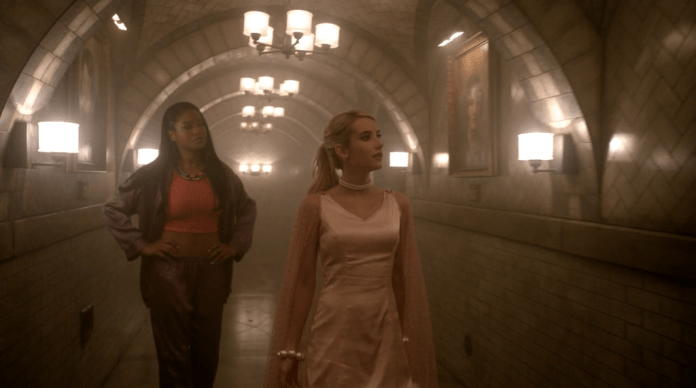 Throughout the season of Scream Queens, Chanel spends a lot of time talking down to her sorority girl minions – literally. With elevation, she delivers her plan – while forcing her pledges to take note from below. If you don’t have a grand, winding staircase and/or balcony to work to your advantage…pick up some platform heels. How to Snag Chanel Oberlin’s Style? Of course, it would not be a discussion on Chanel Oberlin without touching on her fashionable ways. When it comes to building your Chanel Oberlin-inspired wardrobe, think a lot of fur and feathers. Where Blair Waldorf loved ribbons and headbands, Chanel loves fur headpieces, hats and shrugs. She also wears a lot of flashy mohair feathered skirts, pink and platform shoes. From Fendi to Chanel, her designer wardrobe is multi-dimensional. Below is a selection of Chanel-approved pieces to build your personal empire in! GIFT GUIDE: Your Shopping List for Her!